My niece is a born artist..
Artists runs in our family. My older brother is a visual artist while Reign's dad also paints early at the age of 2. Mom used to tell me he draws on any surface, our wall (hahaha), paper, dust on the car etc. so there's no doubt that his daughter Reign would inherit that. She started to draw when she was about 2 1/2 or 3 years old,doodling at 1st then later on making flowers, stick people and more. 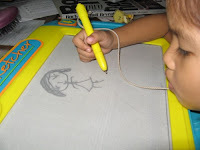 I saw her drawing early yesterday morning, so i hurriedly took my camera to take a video of her while drawing. Here's the video that i took. 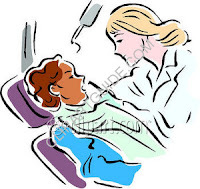 Finally I got time and budget yesterday morning so I sneaked out of my shoppe at 10 am and went to my dentist. It was already long overdue and i was really scheduled to go to her clinic in May and oh boy it was already July so i hurried up and run to her clinic, lol. Good thing is that i was her 1st patient so i don't have to wait in line. I got some few filling over my teeth and had my tooth cleaned. The time i had my check-up she told me t that some parts of my gums are inflamed already so she suggested me to use PYODONTYL toothpaste that i can massage every after regular toothbrushin. I've been using it for a while now and it seems working for me and I reckon i will continue to use to make my gums more healthy. Bought it at Mercury drugstore and if i remember it right it costs about Php 175.00, which can last for about 1 1/2 months. The drilling on my teeth was ok for while but when she is doing the undercut for the fillings to hold, there are times i have to raise my hand bec. i can feel a bit pain. It lasted for about almost 2 hours and my teeth feel refreshed. I better go see her every 6 months so it will not be painful for me when she is doing the cleaning. I know a lot of people would really like to keep fit and healthy at the same time and it’s very hard to achieve that without exerting an effort. Others would subject themselves to too much exercise and physical exertion, others would starve themselves to death. But for some who are so desperate would turn into surgery and drinking diet pills. I believe that eating the right foods is a healthier way to do it plus some exercise as well. I have been reading Nutrisystem users and their testimonials around and perhaps you can try too? Their program is rich in carbohydrates but is still low in fat. It consists of 3 Meals a Day plus Snacks within 28 Days . I believe this is a good way to start dieting w/o having to starve yourself from good foods, you don't want to do that right? 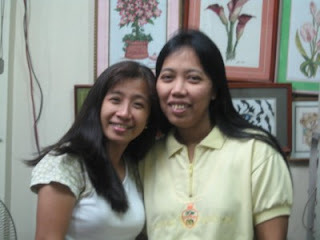 It was last Saturday afternoon when my bestfriend since highschool Racel visited me here at the shoppe. Actually i was a bit busy that time when she saw me a bit stressed or ngarag hehehe. 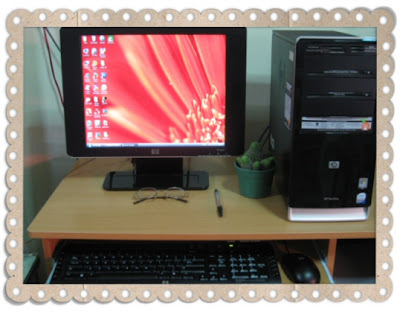 My internet cafe was full at that time and i am glad that my sis inlaw is there to help me out. 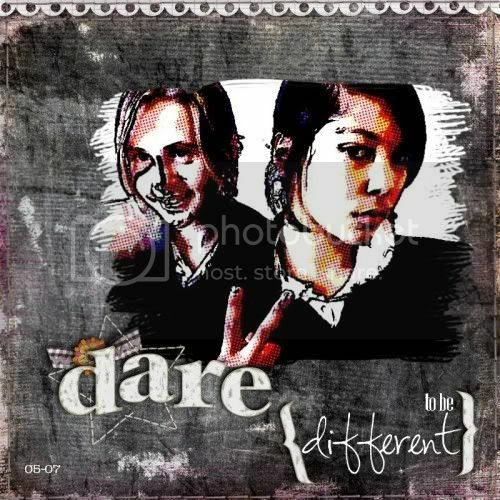 Racel or "bes" (short for bestfriend) and I shared a lot and i was the one who encouraged and inspired her to do blogging. And since she is practically busy each day, she just sneak at the office to write a post or two. Right now she is enjoying every minute of her blogging and indeed she is into the blogging world. I helped her in building her journal and i guess she becomes addicted to it already bec. she got 3 blogs right now hahaha. I will share our pic later.. Flying using charter planes are made easy bywww.FlyPrudent.com. They will help you choose the best aircraft for your trip. You can easily quote your trips via their website and they will respond quickly. They offer variety of specialized services such as Concierge services with ground transportation, dining, and entertainment. Air Ambulance Services where they help transport people with medical conditions,. They also have Helicopters, Aircraft Management, Sales and Leasing. Fly high in style. I went shopping on Sunday. Went to Greenhills with my family bec. 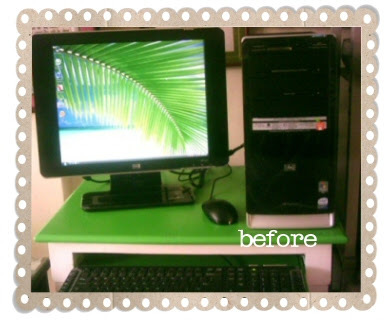 we bought another pc for our café, we have it assembled at the same store where we bought our 1st few units in May. It was at PC Gilmore in Shoppesville and as a returning customer, we got some discounts.The mall is always jam-packed every Sunday; a lot of people are shopping for computer, cellphone, clothes and more. I bought also some supplies for my pc. I bought Kingston memory and upgraded my pc from 1GB to 2Gb of memory because my pc is slowing down when I try to use Photoshop and PSP8 at the same time, running on Vista eats a lot of memory too. Aside from that, I also bought headset, CDRs, printer ink and lots more. After buying all those stuffs, I left my family and I went to shop for myself alone. I got a headache while goin all through the stalls around Virramall’s tiangge so went to Mercury drug to buy a medicine. I bought 2 cute blouses at Hugs and in a different stall. I just love brown color for my shirt so I end up buying 2. I saw a cute leather bag over at Virramall but I managed to control myself in buying that. After goin through all the shop I went straight to Robinson’s galleria and there I bought 1 LEE maong jeans and a cargo mini pants. I also bought 2 pairs of sandals (one is on sale actually), personal care. 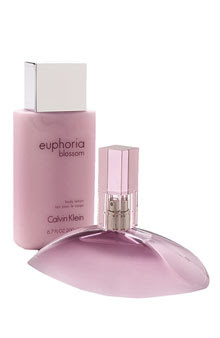 I passed by the perfume section at Robinson’s Galleria in Ortigas and the salesman gave me a sample of one of the perfume and I liked the smell, it was actually Calvin Klein’s EUPHORIA BLOSSOM. Thinking that it was on sale 30% off just like other perfumes, I was tempted to buy. It turned out to be not on sale, the salesman did not want to let me go so he called their head and they gave me a good deal. I got the perfume and lotion 30% off with free bag and mini perfume added. Yikes I end buying the box of perfume eventhough it was not on my shopping list, my impulse buying got me again, pooh. Have you tried this before? If not, you should try, the smell is mild sweet floral scent and not over powering. I also passed by the watch section and I tried on some watches (Fossil and DKNY), it’s good I don’t have enough money or else I end up buying one, I think I’ll buy the next weekend..geeshh addicting. I’m enjoying my hard earned money so no one can tell me I’m over spending hehehe. I just saw it was almost 9 pm when I was at National Bookstore and that is the only time I hurried myself to go home and they were already closing. Yay, I got home by 10:00 pm and I was so tired I wasn’t able to fit all the items I got, I just ate dinner and boom I slept like log.. It’s no doubt that I shop till I drop. >Lately I have successfully cut off my cravings for junk foods, it will come from time to time esp if I have my period. I can eat maybe one or 2 pieces of it but not the whole pack. I am not getting any younger so I decided to remove that off my daily food intake. I’d rather eat bread than to eat a junk one. I hope I can keep up with this. Drinking Coke still remains my battle that I have to defeat; this one is goin’ to be hard I know. Anyway, while surfing around as my daily usual routine for finding good stuffs, nice to read blogs, gossips and more I came across this site that caught my attention. Veggies in a small packet and can be drink? Hmmmm sounds so interesting. I read more about the product info and this is actually made of 95% dried whole vegetables and 5% dried whole vegetable extracts. My Daily Veggies is not a juice and not even a soup, it can be mixed with dishes to further enhance the nutritional value of it. What makes it healthier is that it contains no salt, no preservatives and no sugar. My Daily Veggies Free Sample at their site. I believe many would try this for an alternative on the go food for a healthier living. Are you into digi scrapping ?? I am so glad that finally my mojo is back, which is great because I'm back to scrapping. There come a time when i don't feel like making a layout but lately i found myself downloading freebies stuffs from various blogs and just recently bought some ribbons. 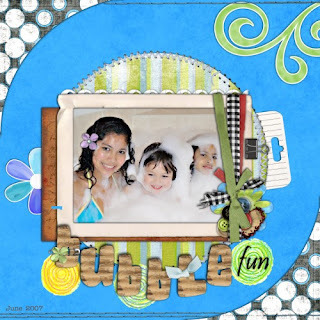 Scrapping is my way to destress from work, just like any hobby digital scrapbooking is addictive. I had fun browsing through galleries to see other's designs and layouts. That is where i got my inspiration and idea. I hope i can scrap more as i still have lots of pictures to scrap. 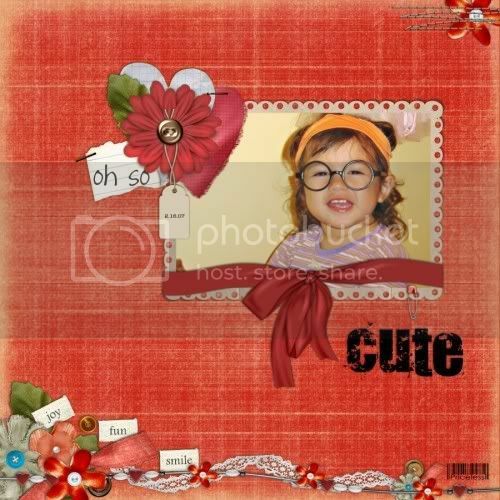 If you have not tried digi scrapping, i suggest you to try it and for sure you'll get to it. Digi Scrapping just like paper s. is a way to preserve the memories. Layouts can be printed and will look like it has been paper scrapped esp. if it is 300 dpi. For those Pinays who is into this you can join our forum Philippine Digiscrappers Forum, it is where we share our layouts, tips and tutorials. Not only that we also share anything under the sun. We have a fun and great digiscrappers. Come join us !! You may have noticed on my side bar that I have listed the 5 blogs that I have. Actually I enjoyed writing and keeping all the blogs that I own. 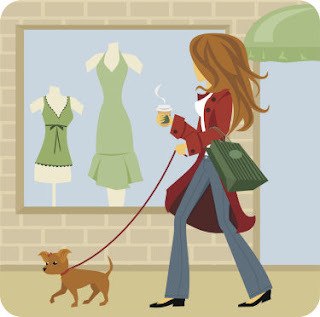 My blogs have different themes like shopping, personal, my digital scrapbooking, technology and more. I personally know someone that has more blogs that I have and like any other bloggers we enjoyed posting and interacting with our co-bloggers especially if they post comments and leave tags just to say hi. Anyway, some bloggers who are keen on business or politics may find this Business Blog helpful and interesting. I stumbled on it while browsing this morning. A co-blogger named Gaurav Bhola shares expert advice and current news event stories with other Bloggers interested in business, politics, finance, health, technology and other newsworthy topics. I reckon it is also appealing to read blogs with other topics to keep ourselves well informed. Would you believe this is my 1st time to buy my own appliance just for myself? Oh yeah I just bought a new Sharp Aphrody 21” flatron TV and dvd player for my room. The TV is on sale along with the dvd player and free Tv rack. Actually I was only looking for 14” or 17” Tv to fit just right on my small room but I can’t resist the promo at the store where we bought it. If I will only buy 17” Tv and buy the dvd separately it is much more expensive, so I grabbed the promo. This is my very 1st time to buy an appliance for myself and with my own money and I am so happy!!! Wow the 20+ year old Tv that I am using in my room will finally be replaced. My old sharp Tv was too old that the channel buttons were almost all gone already. Funny thing is that every time I need to change to channel 7, I still need to get my tweezer to push the button hahaha!!. Now I have a remote control for easy changing channels. I was browsing various online digi galleries yesterday and I was so amazed with the elements they are using particularly the tied ribbon wrappers. Love it so much that I look for the designer. 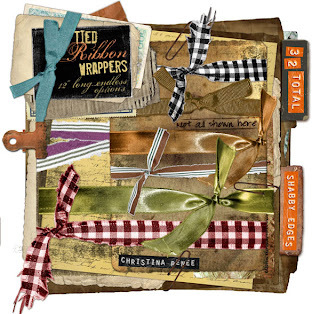 I found out that it was made and sold my Christina Renee and so I immediately googled and search where she is selling those lovely ribbons. The search led me to her own website and in no time I was glued to her site and could not resist in buying these ribbons. I have been planning to buy a new work desk for my pc since May and it was only just last Sunday that i was able to buy a new one at Home Works at Ever mall. Actually that was not really the table that i wanted but they have no other display and stock so i just bought it na lang. But at least now i have a much nicer table compared before. 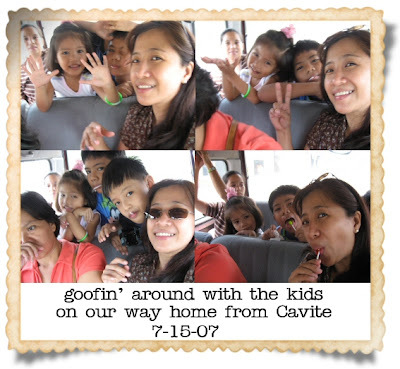 Sunday early morning around 8:30 am we head for Bacoor Cavite to meet the neighbor of my sis Joy in Autsralia who came home for a vacation. It was almost 10;00 am when we reached the place. It's not that far since we used the C5 road and being Sunday there's no traffic. We find the place after asking directions from the local. We met Tita Tess and her daughter and granddaughters. Sis sent us chocolates, pictures and video of them in Australia.. We in turn send them painting of my older brother and my application papers. Here are some pics that I took inside our van. After lunch we went to the nearby mall and bought groceries and my table desk. Wow what a very unlucky day for me….!!! I wasn’t able to open my net café till 2 pm bec. there was NO INTERNET CONNECTION when i opened it this morning!!!! Gosh, I felt I was disconnected from the world when that happened. I kept on calling my Internet server but the technical support is too busy to answer my calls. I am sure a lot of subscribers are calling them at that time. This is the 1st time that it happened. There are days that 1- 2 mins I wasn’t able to connect but in no time the connection will be ok, but this time it took so long. While waiting for the connection to be back I as able to make 1 scrap layout and was able to organize the freebies that I was able to download since the other day. EDited: my oh my, my connection got cut OFF again at 4 pm, at it's only now 5:38 pm that it was connected again. !!!! And my shop is already closed and i lost customers for today. Beware of the Ponzi Investment Scam !!! I guess you have already heard on news last night about the FRANC SWISS, an online Ponzi investment. Securities and Exchange Commission (SEC) and the BSP (Banko Sentral ng Pilipinas) said that it's no different from the "pyramiding" scam. You have to invest $1,000 and it will earn $45 a day. Hello $1,000???? i am not crazy to invest $1,000 for an online investment that is not sure. There's no such easy money in this world, you know. I read Che's blog and it seems that her cousin was one of those scammed, oh so sorry to hear this. We are glad that Dither learned to read words at home even before he starts to go to school. It was always fun to see him open his little book when he was just about 4 years old. Now that he is in grade 4 his reading has definitely improved, I just don’t like his handwriting. For those kids who are having a hard time reading I reckon they need to get one of the reading tutors available at Score Educational Centers for they can help them read and learn in fun way. Like what i have promised myself, i went out on Sunday at the mall to give myself a break from my work. It was after lunch that i went to Greenhills Shopping Center (my fave place). I bought my Adobe Photoshop CS3 and some other stuffs. I was alone (as always), and i just noticed that I was there for only half an hour and i already wished to go home..lol This is not so normal for me since i can shop form morning till the afternoon..lol I guess i am really already getting old and taking too long to shop makes me tired already. Anyway, i just looked around to see some of the cute new fashion blouses, i was about to buy, thank God the one that i liked didn't fit me...lol. It was so crowded that Sunday that i was so lazy to roam around, actually i was looking for table for my shop but i didn't find any that suits the size that i want. There is a mini show and display of the TRANSFORMERS collectibles and other toys inside Virra Mall and here are 2 pics that i took. 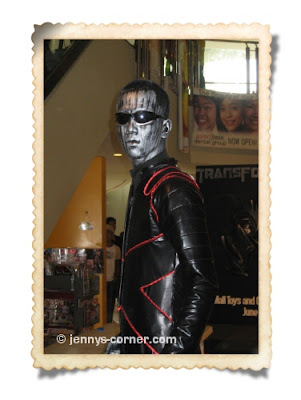 They are actually people but when you see them from afar they look like robots. If only my nephews are with me i'm sure they will like to see this. After watching for few moments at Virra Mall, i went straight to Robinson's Galleria. 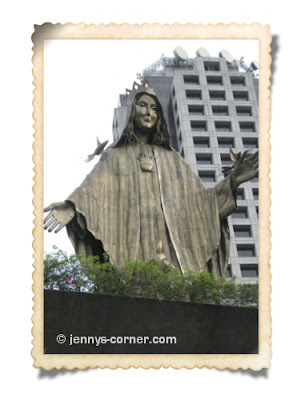 I took a jeepney and went down at EDSA. Just took a pic of the Shrine.. I bought some stuffs at the Robinson's GAlleria. I was looking for the DIGITAL SCARPBOOKING magazine where KAJE saw my logo design but it is not available at the magazine stands. I just got exhausted that i decided to go home already by 5:30 pm.